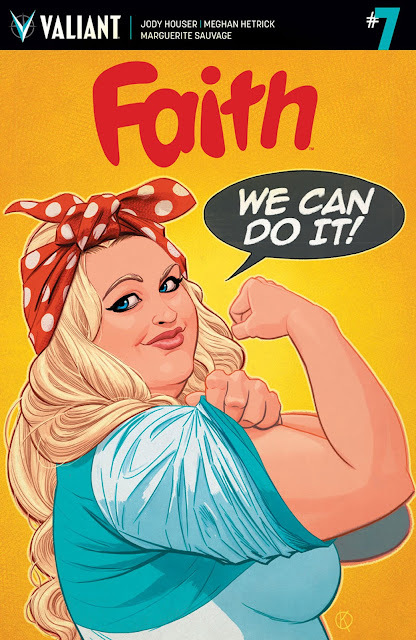 After a freshman year that saw 'Faith' become one of 2016's best comics, Jody Houser enters the new year with another solid issue that throws yet another mysterious calamity at our fearless hero. Faith is being inexplicably haunted and it's wreaking havoc on her life, at home, and at work. What could these spirits possibly want from her now? 'Faith' has injected the superhero comic biz with a fresh resurgence of positivity, heroism, and relatability. Houser's confident but self-aware Faith Herbert is the hero we need right now and she continues to shine in arguably Valiant's best series. In her short run so far she's been able to overcome a lot but there's no rest when she begins having terrible nightmares and visions. They get progressively worse but credit Houser with not giving away the reason for them just yet. As usual, we're rooting for Faith the entire way and growing quite concerned for her mental health. There's more at play than meets the eye and Houser's increased intensity and anxiety as the issue unfolds creates a great cliffhanger in this mysterious new arc. New artist to the book, Joe Eisma, seamlessly takes over with very clean lines in the style of previous artists like Francis Portela and Pere Perez. I've been pleasantly surprised how well Marguerite Sauvage's work has been used in the series. Whether it's flashbacks, dreams, or in this case, nightmares, Sauvage's effervescent designs add new dimensions to the story. 'Faith' continues to be a joy to read as Houser and company deliver great character-driven stories and exceptional art. Faith is tested and dragged through some dark moments in her past. We're heavily invested in this new arc because we don't who or why she's being haunted this way. It's a good point for new readers to jump in and find out what makes this book so great.